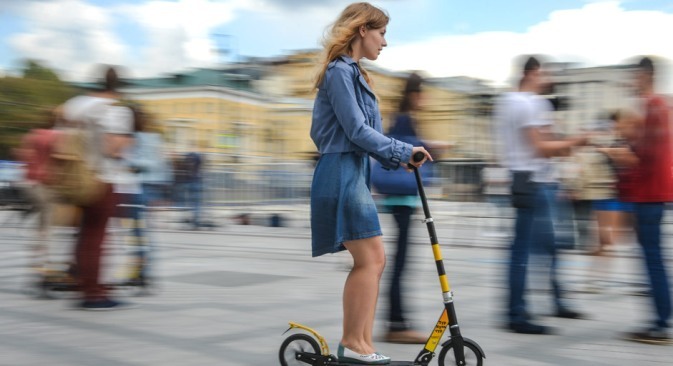 A network of kick scooter rental stations opens in Moscow. Next year, a network of kick scooter rental stations opens in Moscow, Berlin, Brussels and Paris. The service will be available through an app, and rental points will be linked into a single network through a cloud platform. Russian entrepreneur Vasily Bykov, founder of Samocat.net, is inspired by the trend he's seen over the past several years --- a growing number of Muscovites, fed up with traffic jams and long distances, use kick scooters to get from the nearest metro station to their place of work. Next year, he plans to launch a network of rental points where people can rent a scooter. Each point will occupy an area of up to two square meters, and offer from 6 to 12 scooters. Rentals will cost about $10 a month, or $1.5 a day; and renting a scooter for less than 60 minutes will be free. According to Bykov, the company plans to set up 50 rental points in Moscow, St Petersburg and Kazan, and it will soon launch the service in Berlin, Paris, and Brussels. Rental points will have no screens or buttons because clients will use the service via a smartphone app. While bike-sharing schemes cater to those who need to cover a distance of 2 to 5 kilometers, Bykov said that his business will fill the 500 meter to 2 km niche. He developed a business plan for his start-up while studying at the Vlerick Business School in Belgium, and has already put together an international team from France, Germany and Russia. Now, Bykov is ordering components for the prototype of the first rental point. The design is from France; the chassis from China; and the electronics and the cloud service are from the Moscow State University laboratory. Assembly will be done at a plant in Kaliningrad. Bykov and his partner have put up 100,000 euros to launch the project in Russia, but to enter the world market he needs 500,000 euros more. He is currently in talks with several investment funds to raise financing. The startup also participates in the GenerationS competition for technology startups. The first 50 scooter rental points will be located in public gardens, science parks, and large shopping centers. Bykov expects that initially the service will be used by at least 1,000 people a day. Bykov’s business plan takes into account the risk of possible damage to scooters, and losses as a result of vandalism will be covered by insurance. If a user breaks a scooter by accident and brings it to the rental point, the company will take care of the repairs. Samocat.net estimates that accidental damage will not exceed 3 to 5 percent of the total rental amount. The RBTH Russian Startups Rating is coming soon! For updates, please, check our startup section.